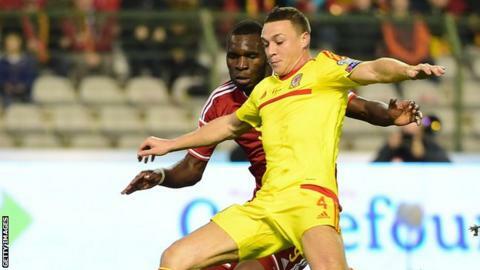 Wales defender James Chester has insisted the post season break before the crucial Euro 2016 qualifier with Belgium will be good for the players. The FA of Wales has opted against staging a friendly ahead of the June 12 tie at the Cardiff City Stadium. Hull City centre back Chester, 26, said: "I am sure we will be training a couple of weeks before the game, so I don't think fitness will be a problem. "May be a few weeks off will do everyone a bit of good." Chester missed the victory over Israel as he recovered from a collar bone injury which happened when West Ham defender James Collins - a Wales team mate - fell on him during a Premier League clash in January. "It's been a frustrating time," he said. "I think it was close to three months out with injury which was longer than I was expecting. It was difficult but it's nice to be back." He added: "I think I could have done with someone smaller than 'Ginge' [Collins] falling on top of me to be honest. "But I think as a footballer you have to accept you are going to get injuries, I don't think there was any malice in it at all, though it was quite sore for a few days after. "In fairness to 'Ginge' he texted me a few days after the game apologising and wishing me the best in my recovery." Chester will be looking to regain his place, ironically from Collins, when Wales take on Belgium. He has been the first choice alongside captain Ashley Williams in the heart of the Wales defence since his debut in last summer's friendly with Holland. Wales are unbeaten and level on points with leaders Belgium with five matches to go. "The Israel victory was huge for us especially with the start they had made," said Chester. "Taking points off them has given us a huge chance of finishing in the qualifying positions,"
Before he can think about Belgium, though, the Warrington-born former Manchester United defender - who qualifies for Wales because his mother is from Rhyl - will be looking to help relegation-threatened Hull avoid the drop from the top flight. "If I can get these six games out of the way and we are still in the Premier League, it will be great to go into the Belgium game on a big high," said Chester. Chester has also set himself another goal before the big Euro 2016 Group B match - to learn the Welsh national anthem, Hen Wlad Fy Nhadau. He said: "I'm trying my hardest . . . I am getting there. It's just the letters and the words together are hard to pronounce so I have an app to help me. "To be fair all the lads can sing it. I need to pull my finger out. Hopefully by the Belgium game I can sing it."